Diabetes costs the U.S. economy over 200 billion dollars annually and this could increase to over one trillion dollars in the next twenty years. Over 40% of all children born after the year 2000 will be diabetic sometime during their life time. Diabetes takes 20 years off of a person’s life. The generation born in the beginning of this century will be the first generation since the beginning of human existence that will not live longer than their parents did and diabetes is one of the main reasons. About 90% of diabetes is preventable and many people who are currently diabetic could reverse their condition if they ate better, exercised and took a few scientifically proven supplements. Only Rebecca’s young male friend Mark has sympathy initially but she gains friends and allies as the story unfolds. These include people she finds online who have similar challenges, referrals from the local health food store, a keen law professor/lawyer and a brilliant Holistic Medical Doctor right in her hometown. This is a traumatic journey for Rebecca who agonizes so much about the confrontation with her parents that she dreams she is on the Jerry Springer Show where all hell breaks loose. The gathering of witnesses and expert testimony for the upcoming trial is finally undertaken by her band of friends and allies including Sam, a strange little fellow with a quirky but healthy crush on Rebecca, and his posse. They all do their jobs well and the court scene is very revealing not only in terms of how poorly many mothers feed their children but also how tuned out the conventional medical establishment is to scientifically proven natural treatments for diabetes. Rebecca wins her case, but there is a slight twist. 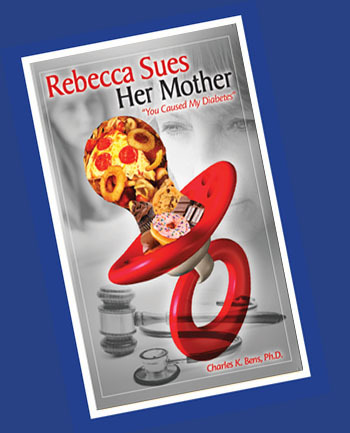 The judge orders Rebecca to work with her mother and her new Holistic Medical Doctor to reverse her diabetes within twelve months. That’s right, reverse her diabetes, because so many other people have been able to accomplish that very thing. If she is not successful, and if her mother did not seriously assist her, then Rebecca’s parents would be required to set up a trust fund in the amount of $250,000 to pay for her future medical costs. The dramatic ending of the book occurs when Rebecca and her doctor appear with her mother on the Larry King Show. In the course of this potentially very tense situation it is revealed by Rebecca’s doctor that some very significant changes seem to be happening as a result of the trial. The National Diabetes Association has expressed interest in promoting the use of scientifically proven supplements; the American Medical Association wants to design a course for doctors to take to learn more about nutritional therapies for chronic diseases; and food companies have begun to express interest in making healthier foods, probably because they are afraid that there soon could be new laws to force them to do this anyway. Rebecca’s mother sees what is happening and there is a tearful reunion of mother and daughter as Rebecca’s mother says, “Becca, you did the right thing”. At the conclusion of the story there will be a list of resources for people to learn more about this very important topic. There will be books, web sites and other resources to help people learn how to both prevent and treat diabetes. This project was conceived by Charles Bens, owner of Healthy at Work, Inc., a workplace wellness company, the author of nine books, over 200 articles and four university courses. He has made several presentations to Florida Legislators on the Impact of Nutrition on the Florida State Budget and contributed eight modules on child nutrition to the web site Live Strong.